In acknowledging, though not stressing, my disciplinary identity as a sociologist, I will present and reflect on several challenges that we are confronted with when analysing social movements. Among the many more challenges that exist, five of these will be identified, discussed and partly illustrated in what follows: defining the subject of research, asking relevant questions, theorizing social movements, choosing adequate methods and sources, and interpreting and contextualizing findings. Doug McAdam, John D. McCarthy and Mayer N. Zald (eds), Comparative Perspectives on Social Movements: Political Opportunities, Mobilizing Structures, and Cultural Framings (Cambridge: Cambridge University Press, 1996). This collective volume is structured along the three concepts mentioned in the subtitle. It marks the state of the art, at least of the mainstream, in social movement studies by the mid-1990s. In the meantime, the three concepts have become more refined. Moreover, other approaches, representing the cultural turn in social movement studies, have gained importance. Apart from its conceptual focus, additional strengths of this volume are chapters in a comparative perspective, chapters on Eastern Europe and two chapters on historical movements. Doug McAdam, Sidney Tarrow and Charles Tilly, Dynamics of Contention (Cambridge: Cambridge University Press, 2001). The authors aim at broadening the field of social movements by proposing the notion of contentious politics (already earlier suggested by Tilly). They advocate a process-oriented, dynamic perspective in which ‘robust, widely applicable causal mechanisms’ play a key role. Each of these mechanisms, whose theoretical basis remains somewhat unclear, is exemplified by of a paired comparison of cases that vary considerably in terms of their historical and geographic background. Donatella della Porta and Mario Diani, Social Movements. Issues and Problems. Second revised edition (Oxford/Cambridge, MA: Blackwell, 1999). 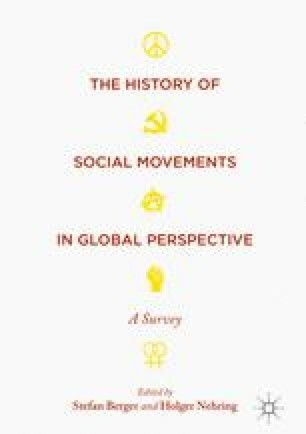 A broad and systematic overview on social movement studies that provides a useful introduction for newcomers to the field but also can serve as a guide and resource for more advanced students. The authors have recently edited a comprehensive volume, The Oxford Handbook on Social Movements (Oxford University Press 2015) that, in 53 chapters and more than 800 pages, goes more into detail. Mario Diani, ‘The Concept of Social Movement’. The Sociological Review 1 (1992), pp. 1–25. This is a relatively early attempt to come to grips with the concept of social movements. The author compares definitions by some of the most influential authors in the field and offers his own ‘synthetic definition’ of a social movement as ‘a network of informal interactions between a plurality of individuals, groups and/or organizations, engaged in a political or cultural conflict, on the basis of a shared collective identity’. James M. Jasper, Protest: A Cultural Introduction to Social Movements (Cambridge: Polity Press, 2015). A well-written, engaged and intriguing introduction into key dimensions and practices of social movements. Without simplifying complex phenomena, this book is especially useful for undergraduate and graduate students. As the subtitle suggests, the book highlights the role of cultural aspects of movements. It provides an exemplary case of the cultural turn in social movement studies, thereby representing a challenge to structural analyses that prevailed from the 1970s to the early 2000s. Hank Johnston, What is a Social Movement? (Cambridge: Polity Press, 2014). This is an excellent and concise up-to-date introduction to the field of social movement studies, including an attempt to clarify the concept of social movement and to elaborate its social, political and cultural aspects. In a condensed form, the author emphasises the role of culture, discourse, identity, frames and emotions without ignoring the structural and organizational dimensions of social movements. Additional sections are devoted to political, cultural and religious movements that, seemingly, are considered as variants of social movements. Karl-Dieter Opp, Theories of Political Protest and Social Movements. A Multidisciplinary Introduction, Critique and Synthesis (London: Routledge, 2009). An attempt to integrate contemporary key approaches in social movement studies (resource mobilization, political opportunity structures, collective identity and the framing perspective) into an extended rational choice perspective. The focus is on the question why individuals engage in social movement activities. One may wonder whether the rational choice perspective is overstretched by this synthetic enterprise on the basis of a ‘general theory of action’. Otthein Rammstedt, Soziale Bewegung (Frankfurt am Main: Suhrkamp, 1978). Even in the German scholarly community, this is a largely ignored but extremely valuable book. It covers the historical semantics of the term social movement as well as the evolution of the concept and theories from the early century to the 1970s. Moreover, the author offers a sophisticated ideal-type of the evolutionary stages of a social movement. Unfortunately, this book was never published in English and therefore remained largely unknown to the Anglo-Saxon scholarly community. Sidney Tarrow, Power in Movement: Social Movements and Contentious Politics. Revised and Updated Third Edition (New York: Cambridge University Press, 2011). This is one of the best known and most often cited books on social movements in the last two decades. It covers a wide range of aspects with a focus on structural patterns on the meso- and macro-levels. The third edition includes more recent developments of transnational mobilization and new material on civil wars, terrorism and guerrilla movements. Compared to the two earlier editions, the third edition strongly reflects Charles Tilly’s influence on Tarrow. Jacquelien van Stekelenburg, Conny Roggeband and Bert Klandermans (eds), The Future of Social Movement Research: Dynamics, Mechanisms, and Processes (Minneapolis and London: University of Minnesota Press, 2013). Conceptual and theoretical aspects are at the fore of this volume structured around: (1) grievances and identities; (2) organizations and networks; (3) the dynamics of mobilization; and (4) the changing context of contention. Each of these four parts is closed by a single-authored ‘discussion’ chapter. This volume represents the cutting-edge of mainstream social movement research but neglects more marginal and radical approaches. It is attractive for specialists and researchers but too demanding for newcomers to this field.